Blade server or a blade-server system is a self-contained system including a number of computer units designed for high-performance and high-capacity computing. A blade server can be seen as a bare-bones stripped-down computer. A blade server is a solution suitable for applications needing a lot of computing horse power. A blade server is sometimes referred to as a high-density server and is typically used in a clustering of servers that are dedicated to a single task. Blade servers are not just a new way to package traditional computing components. Rather than that, they are integrated systems designed to deliver server performance in efficient, high density, easy to expand, and easy to manage units. What is the difference between a server and a blade server? Regular server or a personal computer or a laptop includes at least a mother board, processor, memory, hard drive, keyboard, display, network adapter, video card, and power supply. A home of office personal computer would not be very practical without any of these components. A regular stand-alone server can work without a display and some other devices, but it is still a box with a number of components inside and around. A blade server on the other hand has many components removed for space, power, and other considerations while still having all the functional components to be considered a computer. A blade server in the narrow definition is a thin, modular electronic circuit board capable of performing computational tasks. This is called a blade server or also more precisely a server blade. A blade server in this sense is literally a server on a board containing processors, memory, integrated network controllers, an optional fiber channel host bus adaptor (HBA), and other input/output (IO) ports. Server blades typically come with 1 to 4 processors and integrated Ethernet. A blade server in this meaning includes only the very basic components that are needed for the system as a whole to accomplish some computational power. The term blade server in the wider definition is often used for a server chassis (cabinet) which houses a number of thin, modular electronic circuit boards -- server blades. A server blade is often dedicated to a single application. A blade chassis or enclosure can hold multiple server blades. The chassis provides services to individual server blades, such as power, cooling, networking, various interconnects, and management. Together these components form a blade system, or shortly often called a blade server. In general, each server blade typically comes with one or two local ATA or SCSI hard drives which are often hot swappable. Blade servers are also often designed to be easily connected to additional storage pool, such as Network-Attached Storage (NAS), iSCSI Storage-Area Network (SAN), or Fiber Channel. In some cases, server blades can also come disk-less since they can boot from external storage in a Storage Area Network (SAN). Such configuration can increase reliability and reduce space requirements by partitioning storage resources in one centralized location and computing resources in another. This also eliminates storage redundancies and simplifies storage management. To make the story short, each server blade is a blade server in its own, but the whole cabinet with individual server blades is often what IT professionals call a blade server. What for can I use a blade server? The variety of use has been growing over time. Blade servers are ideal for specific purposes such as web hosting and cluster computing. For example Google is running blade servers in their farm. Insurance companies and banks are big users of server farms or blade servers. Banks and insurance companies often employ blades to run their economic and actuarial models on grid networks with blade servers. What is the price of a blade server? It depends. Depending on the use and complexity of a server blade, you can buy an entry-level server blade for some $700. High end server blades go for 10 to 20 thousand a piece. Blade server chassis can host variable number of server blades. 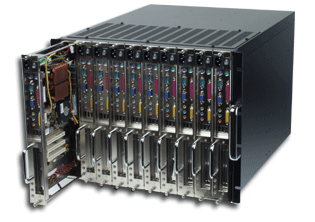 Common blade server chassis can hold 14 or 16 server blades. Entry-level chassis start at around $2,500 and up. When you add the cost of support, setup, infrastructure, cooling, maintenance, and other, you can easily get to $20,000 for an entry-level blade server just to start. What are the advantages and disadvantages of using blade servers? You can read about advantages and disadvantages at the next page: Advantages and disadvantages of blade servers.